Pardon the delay, I meant to release this update alongside A Planar Grimoire, but a few things got in the way. Anyway, here’s four new werebeasts, as well as four new NPC creatures to torture your heroes with, all outside of the norm for the curse of lycanthropy. On top of that, the NPCs all have a roguish-assassin type of theme. Seawolf (Swashbuckler) – A seafaring terror that can stalk both on deck and in the murky depths. Its NPC counterpart is a cruel sailor who mingles with crews before viciously slaying as many as possible, usually amidst a deadly storm or allied seawolves. Weremantis (Shadowdancer) – A were-insectoid capable of long reach and deadly bite. Its NPC counterpart is a master of stealth and dark sorceries. Wereserpent (Stygian Cultist) – Cursed with the blood of snakes, this creature can not only doom others to such a life, but can choose to kill undesirables through deadly venom instead. The NPC counterpart is dedicated to a dark cabal of death, assassination, dark gods and the lower planes. Werewasp (Toxic Assassin) – This were-insectoid takes to the skies to shock and terrify its prey. While it lacks a potent bite, its curse can be transferred through a venomous sting. Similar to the wereserpent in terms of tactics, the werewasp also has the boon of flight. Due to its natural poisoning ability, its NPC counterpart can unleash a barrage of alchemically augmented toxins, poisons and more. The streets are seemingly cast in a dark and gloomy shade among the lit up lamps. Flittering insects cast sinister shadows on the cobblestones below. However, the chill down your back is far from a winter wind. You feel it, don’t you? A cross between a clacking of razor blades upon your coat mixed with the sharp feeling of exposure to ice. It’s right behind you. As to what it is? You dare not find out, but your doom is likely spelled out for you, regardless. Before you can react, the words, “I have use for you” buzz in your mind before all turns to black. A lot of locals aren’t that friendly to outsiders… This one is no exception. It even drove off most of the natives themselves. “Ah, another wanderer wanting to carve up the land. Surely, you don’t plan on heading to the caves of golden walls? There are tales of sinister things that guard the glistening walls of incredible rock and earth! 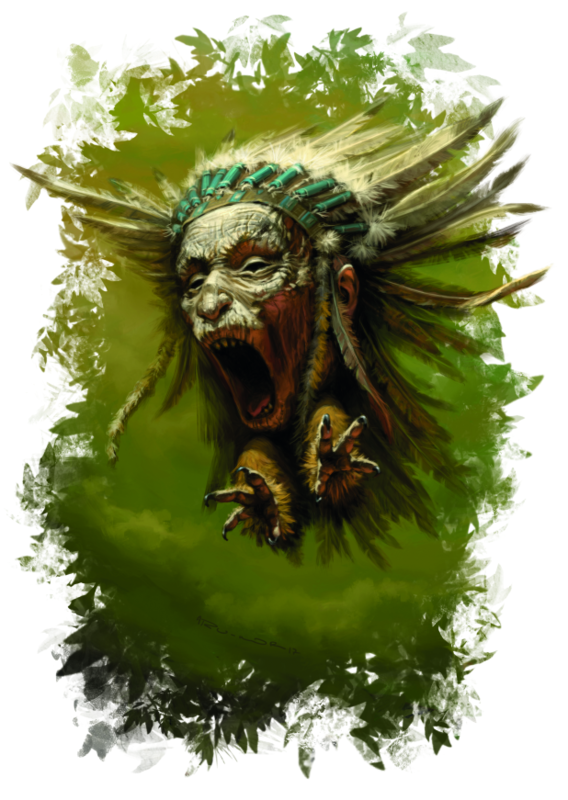 No, friend, you should leave the golden cave down that way alone and continue on your way…” – Crafter-of-Words, a scout for the Clan of the Split Basin, trickster who loves pulling malicious pranks on settlers and travelers alike. Here’s a continuation of my previous post. These creatures are inspired by various beings from lore and legend. Enjoy. Author’s Note: This technically marks post # 300! Wow, that’s crazy! Anyway, thanks again to all who support me! The act of killing by itself is a heinous thing, something adventurers often have to cope with on a common basis. Often it’s self defense against monsters and bandits, other times it’s for more insidious reasons. Some snap amidst the violence, losing any attachment to empathy or reason. Such people degenerate into cold blooded killers, driven by the thrill of slaying whatever prey comes into their clutches. After a while, it becomes less about adventure and discovering lost treasure as it is an unrelenting bloodlust and hatred for all who oppose your goals. This path of bloodshed and psychosis is a chilling and horrid one, the basis for many stories of terrifying villains and disturbed madmen. Much of the time, these evildoers prefer to scare their prey as much as possible before causing them to meet their untimely end. Such tactics are more than butchery and savagery, as the power of psychological terror is essential for weakening their foes. Often, they’ll do whatever to take away their power and isolate a target as much as possible, finding impossible ways to stalk them as well. And when all hope is lost, the killing strike is unleashed! Few have survived the wrath of a murderous maniac… and they usually die in the sequel anyway! AUTHOR’S NOTE: I’ve rediscovered an awesome expansion for World of Darkness known as Slasher. It’s built on the Chronicles era Hunter game, in which Hunters succumb to their own inner darkness and become the very villains of horror cinema lore… essentially. Of course, there’s more to it than that, but whatever. Anyway, here’s a template that borrows heavily from slasher cinema, in an effort to translate the idea into D&D. Enjoy! (I might update with a “Supernatural Slasher” in the near future! Who knows?) Also, as for the picture? I’ve always loved this scene from the original Halloween. Something about that shot highlights a character’s seeming futile attempt to hide from a masked madman… and said murderous pushing into a claustrophobic space, where everything seems lost. Did I mention that movie is one of my all time favorite films? Also, this one will probably be revised once I get more accurate math for this one, maybe swap out one thematic ability for another. I’ll see what people say first.